Forming the boundary between the states of North Dakota and Minnesota, the Red River flows north into Manitoba before entering Lake Winnipeg. Situated in the fertile Red River Valley, the banks of the 885 km (550 mile) long Red River are prone to flooding during the spring thaw, threatening cities and towns along its course like Winnipeg, Manitoba; Fargo, North Dakota and Moorhead, Minnesota. The river is also home to a variety of important fish species, including channel catfish, walleye, and bigmouth buffalo. 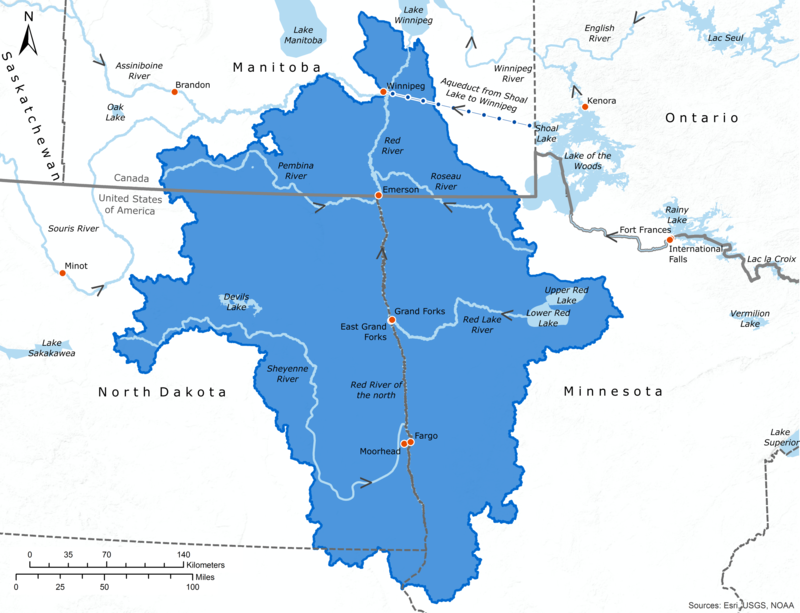 The International Red River Board keeps the IJC informed of basin activities that affect transboundary river flows, water quality, and ecosystem health in the Red River and its tributaries. The Board also monitors the implementation of flood-related recommendations made by the IJC. The board keeps the IJC informed of basin activities that affect flows across the boundary, and water quality and ecosystem health in the Red River and its tributaries. The Board also monitors the implementation of flood-related recommendations made by the IJC.